As 21st Century educators, we have the responsibility to teach digital citizenship as one of the key concept that our students need to adapt to the ever-changing world. Digital Citizenship is not a choice anymore, we must ensure we prepare our students, not for tomorrow but for TODAY. Beyond raising awareness, we equip our students (as people and as learners) with the mindset to be responsible and safe users of technology. Digital Citizenship is not a choice anymore, we must ensure that we prepare our students to the world they already live in. At MBIS, we have developed a way to integrate this crucial aspect of citizenship in positive and creative ways. Seesaw, Google Classroom, Common Sense Education, GoEnnounce and various blogging tools such as: Edublog, Blogger, Weebly or WordPress. 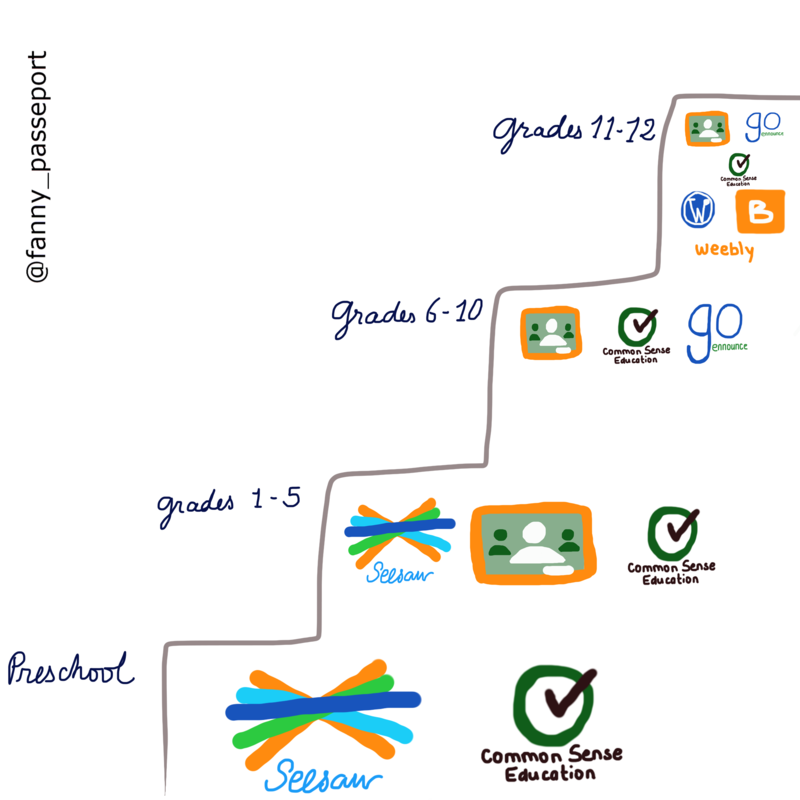 Let’s look at how we embed digital citizenship into the teaching and learning of our students step by step. We chose Seesaw as our main tool to embed digital citizenship and provide an opportunity for our young learners to experience responsibility and creativity. 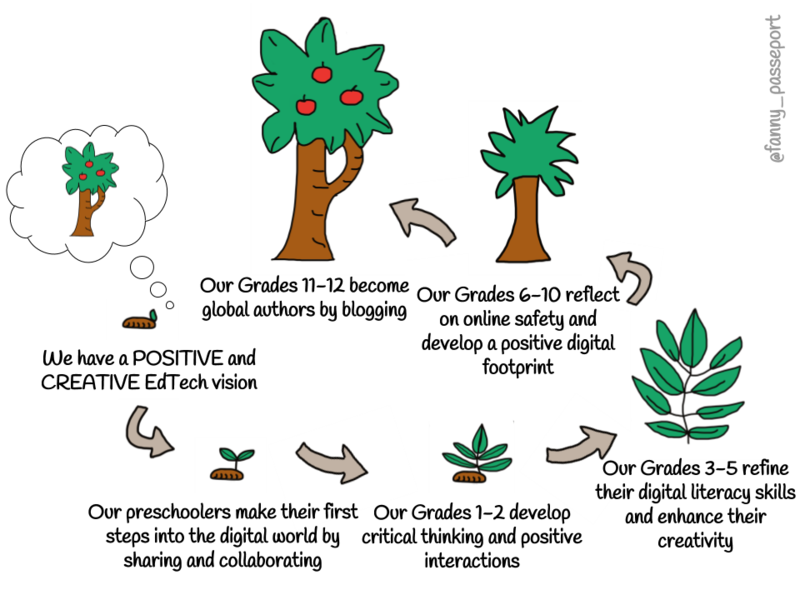 In most of the options, the student can record a voiceover, label a visual, draw which help demonstrate learning and practice reflection. Our use of Seesaw is a live example of learning about and experiencing “Digital Citizenship” by becoming creators and publishers. Students understand what it means to give credit to oneself or others for their ideas as they post their work with their name. While our Seesaw classes are private, we invite parents to join us in their children’s learning journey, so they can see their posts and comment/like to encourage a positive culture. They can also add voice comments in their Mother Tongue. Students create and they take ownership for their learning because they are in charge of posting within the pedagogical settings we agreed on, giving them a lot of room for “compulsive or compulsory sharing” of ideas, choice and voice. Students not only post individually, they also collaborate in group and class posts to celebrate collective learning too. All this contributes in creating a positive school culture where students, teachers, educational administrators and parents interact to celebrate learning. 6- We make the teacher’s life so much easier because students do not need to take “backup”, they simply save on camera roll and upload to Seesaw. 7- It is a live example of learning about and experiencing “Digital Citizenship” by becoming a creator and a publisher. Students can even make mistakes “safely” because Seesaw is not public. Teacher can decide to approve/moderate and keep teaching students about best digital citizenship practices. In PYP1-PYP5, while we continue to use Seesaw mainly for our eportfolio, we also use Google Classroom to learn and share, collaborate and interact, differentiate and celebrate learning. Google Classroom allow more advanced opportunities with G Suite for Education. For instance, a teacher can make virtual copies of a template assignment and each student can start working immediately. It’s a productive space and a place to see the progress of our students. We can provide feedback and grades, keep records and plan lessons to run smoothly. The teacher’s role in the 21st Century classroom is more of a “guide on the side” than a “sage on the stage”. For instance, as the students share a lot more easily and access more and more information independently, teachers make sure they talk about searching for creative common images and resources, giving credits when posting other’s ideas or material and take the time to moderate effectively in order to adjust their teaching on digital citizenship aspects. Teachers use data to inform learning, they can understand the mindset are their students and what they can do to better empower the students to become responsible and safe digital citizens. Students post on Seesaw and/or Google Classroom but they also view each other’s post and comment on their peers’ posts to encourage, motivate and acknowledge other’s learning. Beyond engaging students, our edtech tools help us empower them and develop positive attitudes, such as caring for others. When students see that a classmate “liked” their post, not only do they feel great about the positive feedback but also motivated to push themselves to learn more, share more and also spend the time to comment on other’s posts to give back to their caring peers. Students can make mistakes “safely” because Seesaw and Google Classroom are not public. Teachers can decide to approve/moderate and keep teaching students about the best digital citizenship practices. Mistakes or mean/bullying behaviour seldom occurs because the students are empowered by the way the tools are integrated, with a strong pedagogical base, led by teachers and they evolve in an environment of trust . If ever there were to be a mean comment (not happened yet! ), the teacher would not approve it and use this as a teaching moment to “pause and think about our digital footprint” and get back to the essential agreements set with students which mention: being responsible and kind for instance. Our Middle Years Programme students not only continue to have digital citizenship lessons through our adoption of Common Sense Education Scope and Sequence, but beyond simply “thinking” and “reflecting” about the concept of online responsibility and safety, our students are given opportunities to act by developing a positive and creative digital footprint through the use of GoEnnounce. GoEnnounce is a website for students to develop an online profile about their achievements, their passions and attach pieces they are proud of. It acts like a “LinkedIn” page for students which develops college readiness through a sort of e-portfolio. There is a teacher dashboard to monitor the students and various privacy settings possible. Learning the value of connecting a network to their educational goals & interests. We do not simply create accounts on GoEnnounce, we will offer regular opportunities for students to post & upload projects, assist students with their voice as they track and curate their unique footprint and share their achievements. One of our mission and responsibility as IB educators is to encourage our students to venture into the digital world in a responsible way. Blogging is a way for students to express themselves and share their work with an authentic audience while practicing digital citizenship and showcasing the attributes of the Learner Profile. Through the Creativity, physical Activity and Service learning (CAS) programme, DP students “…follow a process whereby they investigate an interest that often raises questions and curiosity, prepare by learning more, take some form of action, reflect on what they have done along the way, and demonstrate their understanding and the process” (IB DP Creativity, Activity, Service Guide, 2015). Blogging is an excellent way to meet the reflection and demonstration requirements of this programme in a creative and media rich way. For this, we let the students choose but we recommended the following blog platforms that are ad-free: wordpress, weebly, blogger, edublog. Students are encouraged to reflect on their current online presence before creating a blog and are supported by the Tech Integrator to “clean up” if they request help. Ideally, when we do a research for a student name online, we should find entries and those entries should all be positive and formal/semi-formal. Students will use their Blog to reflect and showcase CAS experiences, demonstrate understanding, and provide evidence of meeting the required CAS Learning Outcomes. Not all CAS reflections need to be included in the public blog. Additional reflections and evidence inappropriate for a public audience should be entered into “reflections and evidence” on ManageBac. ManageBac will still be used for simple data and record keeping for all students in addition to the public Blog. Students write posts and use a variety of media in their blog such as videos and photos that will respect the rights and responsibility associated with copyrights, and confidentiality. They might decide to apply a Creative commons licence to their blog (at the footer for instance) by visiting the site: https://creativecommons.org/choose/ and choose the license which represents the level of protection they wish to have. In the process of writing a blog, students become authors. They do not only take ownership of their work but also develop a positive and creative online presence that will help them for their future. We have adopted and adapted the Common Sense Education scope and sequence from preschool to DP2 in order to make sure that each grade level receive specific Digital Citizenship instruction and develop their skills and awareness of online safety and security throughout their schooling. We introduced Webpath Express (linked our library management system called Follett Destiny). This allow our students and teachers to search for educational content over 85,000 trustworthy, relevant websites while filtering out irrelevant and inappropriate content. This is a safe and productive way for all students to research and avoid the distraction of a simple “google search” though we still teach students how to research on the Chrome browser (using Safe Search) using advanced search and operators. For instance, we encourage that students use the operators “sites: .edu”, “sites: .gov” which are published or government sites and question other types of sites that anyone can create with irrelevant information. At MBIS, we follow an edtech vision that is positive and creative. We think technology offer incredible opportunities to accelerate learning, give more choice to student and engage them in expressing themselves, yet we remain realistic and critical thinkers. We are prepared to tackle negative behaviours and have implemented whole school Essential Agreements on Digital Citizenship in the beginning of the school year through our Boot Camps. We also offer an online course on Cyberbullying and Plagiarism as an educational consequence to poor behaviour (in addition to possible other consequences decided by the Principal). As a Common Sense Digital Citizenship Certified School, we are committed to engaging parents in the Digital Citizenship learning journey at MBIS. We involve our parent community too by offering sessions (on campus or online) which are available only for our parent community and connects our “Maker Morning” sessions (once a month on a Saturday morning) to digital literacy and responsible social media curation. We encourage parents the use of Common Sense Education Reviews to make sure that books, TV series, movies, games, apps and others are appropriate for children.